Adequate ventilation is a good thing in a school bus as many do not have any air conditioning. 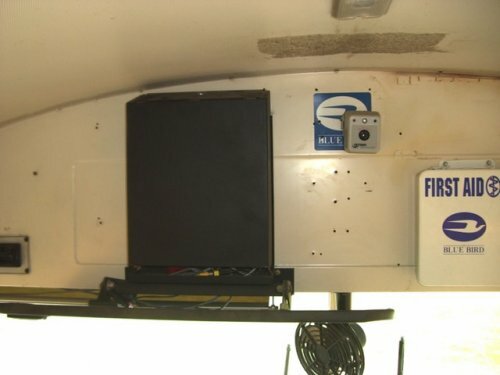 However only after this installer mounted the lock box in the center did they realize they must access the DVR inside the box, and even after mounting the box to the left 1 foot, they still mounted the box so high up they cannot access the face of the DVR without prying the case off from the bottom. If you are going to mess up a bus panel this much at least try to cover the holes with a decal. Whether it involves school bus cameras, digital bus video cameras, vehicle camera, mobile video surveillance systems, digital in-car video camera, in-car camera, bus camera surveillance it is always best to invest in 100% Solid State digital like the SD4m or SD4 series.